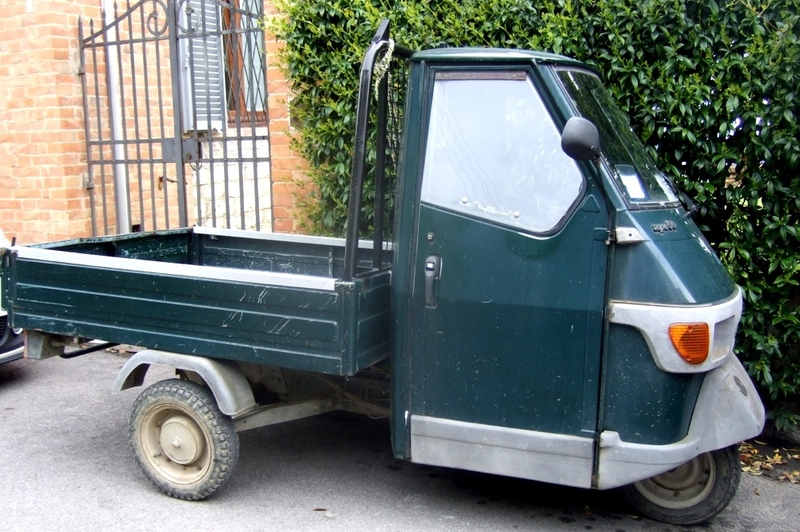 I finally found out the name of those small three-wheeled trucks so often used in Italy. The name is “ape,” and pronounced “ah-peh.” I only learned of this through reading a wonderful book about Italy called Stolen Figs by Mark Rotella. It was recommended to me by another Italian-American who is also passionate about Italy. Also coincidentally I happened to read about it on another blog, Bagni di Lucca and Beyond, where my friend, the author, Debra Kolkka, was explaining that the ape was needed to transport items up the narrow streets and hills in a small village. These vehicles come in handy in villages with steep narrow streets, where a normal size car could never maneuver. They are also great for parking in tight spaces. I have had some questions about photos I have posted of these “apes,” asking if they are glorified golf carts. They are actually made by the company Piaggio, who manufactures the famous Vespa scooter as well as other vehicles. In fact the original model dates back to 1947 and was basically a Vespa with two wheels added to the rear. 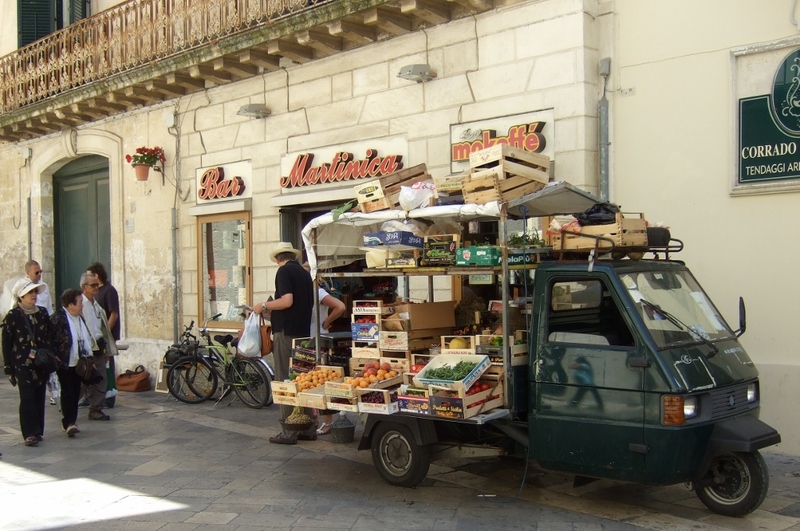 Although I believe this photo is of a regular truck and not an actual ape, I have seen these apes used as portable roadside market stalls, where vegetables, flowers and all other types of goods are loaded onto the back. Originally made for one passenger, there is a second seat but it is a tight fit. I do like seeing these little vehicles around in Italy. 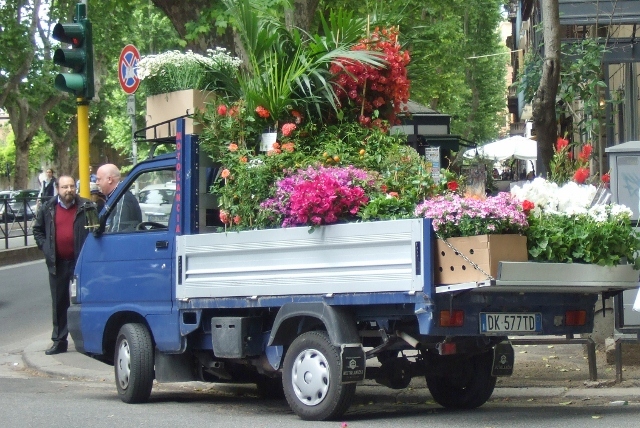 What do you think of these little trucks in Italy? Have you checked out my Facebook page yet? Please stop by and LIKE it – lots happening there. There was a wedding last week in Bagni di Lucca last week where the bride and bridesmaid arrived in an ape. I guess you know it means bee, because of the sound they make. Vespa means wasp. Yes Debra, thanks to your blog I learned it means “bee.” A wedding in an ape..Wow – only in Italy! We saw apes everywhere in Italy and fell in love with them but only got one photo in the narrow back streets of Assisi, they remind me of the 3 wheeled car in the Mr Bean television show. I think they are so cute and handy too! I wonder if they are legal for the streets of Washington, DC? I would love one for America!!! I love pieces such as this. It was engaging and informational. As well, it spurred me to ponder how our geophysical landscapes (both built and natural) influence how we shape the tools used in our lives–variants of which may be found in many other places, each bowing to the specific needs and cultural ideas of a population–such as the vehicles we employ. I have been trying to figure how I can get and use one in San Francisco for my shopping farm markets.